Some folks just never learn. 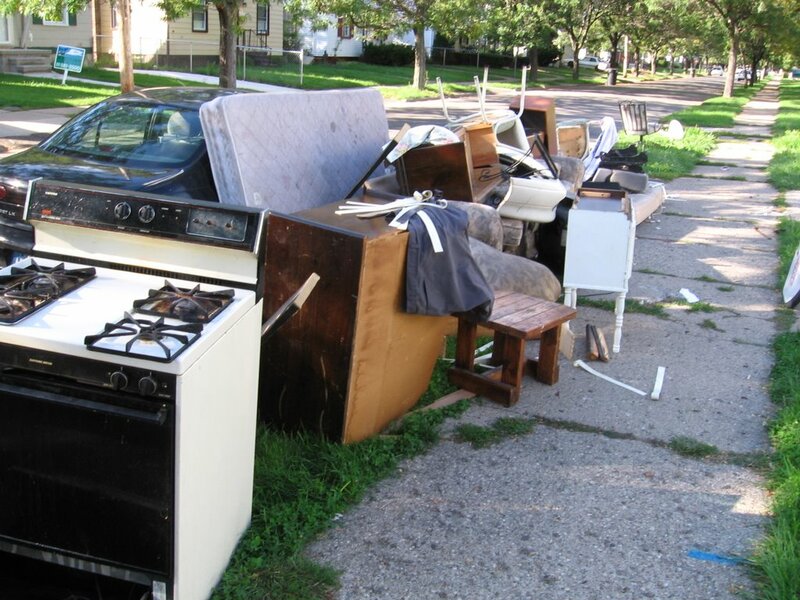 The Detroit City Council amended the City Code two weeks ago; requiring landlords to provide roll-off containers who any household items that an evicted tenant might not be able to cart away during an eviction. The new legal requirement was well publicized in the major daily newspapers and in this blog. In spite of that, some nitwit did an illegal eviction in Warrendale this morning (6730 Brace, to be precise) and failed to provide the required roll-off container. I called the 3-1-1 Call Center when I noticed it this afternoon and was told by the operator that someone else in the neighborhood had already reported it. The nitwit landlord is now facing a fine that will range from $200 - $1,000 depending on whether or not this is his or her first offense; far more than what it would've cost to rent a roll-off container. Oh, and if anyone wants to earn a couple of extra bucks - the oven (pictured above) and a couple of other things could easily be sold for scrap. If you've got a truck and someone to help with the lifting, I don't think anyone would complain about you grabbing it. Yeah, and I'm sure that someone REALLY loves it. I admit that I don't know much about eviction, but doesn't that stove and the other property belong to someone? I would think that the evicted person or persons still need to get their things. I guess what I am getting at is that I think it's irresponsible for you to encourage someone to steal the tenant's property. I do realize that it is unsightly. I just think there is a more responsible course of action. I appreciate it your thoughts, but once their property has been left on a public sidewalk for so long (in this case almost 2 days) and it doesn't even appear that they're trying to remove it - I don't think they much grounds for complaining if/when someone else carts it away. This is especially true when all that will otherwise happen is the City will simply cart it away to a landfill.